Available exclusively at The Container Store, our Elfa Utility Boards help you get organized in the craft room, kitchen, office or garage. They're used between two Hanging Standards or freestanding Uprights. Combine them with our Elfa Utility Shelves, Boxes and Hooks to create a sophisticated, functional update on the classic pegboard system. You can also mount the 15" Board directly to a wall (mounting hardware sold separately). Platinum Elfa Utility Boards is rated 4.6 out of 5 by 60. Rated 1 out of 5 by Amcal from Worst peg board product on the market I have 3 Elfa units in my craft room that each contain a utility board. I can’t even express adequately how horrible this product is. The slats are small and rectangular, so only CS utility board components fit in the holes. The components have cheap plastic hooks, and at least 1/3 of my products have broken just trying to get them to “lock” into place. A lot of the hooks simply refuse to lock in place, so the hooks fall every time you touch them. After struggling for years to find a solution to this utility board nightmare, I finally discovered the perfect solution. The cheap hooks work perfectly for mounting a quality pegboard to this piece of crap! Rated 5 out of 5 by JNThigpen from Versatile Design I used this piece to place my Elfa desk in order to creat a backboard to my dogs sleeping area and to keep her from getting into cords. I love there are so many creative uses for this simple piece. Rated 5 out of 5 by Meems78 from Exactly what I needed This works exactly as I expected. I like that I can move it around easily and expand if needed. Works perfectly. Rated 5 out of 5 by BusyMom04 from Best Magnet Board! This might me my favorite part of my new desk! The Utility board fits perfectly underneath my Elfa Shelving, and just above my beautiful white desk! It's the perfect size to hold my pencil cups, pictures, and to-do list. Rated 5 out of 5 by craftynanny from ELFA IS THE ONLY WAY TO GO! I purchased this a few years ago for my sewing/craft room. Recently added another section. Best value and quality for the price! It doesn’t get any easier! Rated 5 out of 5 by TessP from So much nicer than peg board After 11 years, I finally convinced my husband not to squirrel away all the stuff related to his bikes and guitars, which had been in boxes here and there all over the house. Creating a space where the nice bike hangs, utility boards below, cords, tubes, mics, amps - it’s incredible. My **only** suggestion is that i wish the board tray could be flipped over to make a shelf. Rated 4 out of 5 by FSwin from Great product, but IMPOSSIBLE to rearrange I love our garage Elfa system. I was ready to add more to our system with the utility boards, but I quickly realized once the board is placed that’s it! This board looks great, works well as far as organizing those little items that can get lost. A great purchase, but I wish I could move it around a bit. Rated 5 out of 5 by Ebalina from The bins, hooks & trays that can be added/attached to this make it versatile for storage of hand tools, power tools (e.g. drills) & an assortment of nuts/bolts, etc. Rated 5 out of 5 by Jude75248 from Rock Star Pegboard I downsized from a 3000 square foot house with an attached, double car garage to a TINY condo with no garage and almost no storage space, so when I saw the 2' x 3' x 8' utility closet on the patio, I knew that I had to maximize the space to make every square inch work for me. I hung an Elfa Easy Hang track at the top of the back wall, and added 7 ventilated shelves and on a whim, I picked up a 2' metal pegboard. I spaced the standards 24" apart so I could mount the pegboard onto the standards, which made it very easy to install. I'm 68 years old, and this was a piece of cake to install. Worth noting though: the pegboard locks into place with 2 small brackets halfway down on each side. After initially installing it, I decided I wanted it slightly lower, and it took me about 20 minutes on the internet to find out how to unlock it, which you can do by simply inserting a flat head screwdriver beneath the locking brackets, one at a time, and prying upward. Once I figured this out, removing and re-installing it was easy. I purchased a variety of hooks and boxes to hold what I wanted on the pegboard. The variety of hooks needs to be expanded, e.g., you can put a needle-nosed pliers in the circle hole hook, but there's nothing that will neatly hold a regular pair of pliers. You'll need to arch the plastic hooks out before pushing down on them to snap them into place, or you risk snapping off the tab on the back, thereby rendering the hook useless. I believe this needs improvement, but other than that, I'm loving the metal pegboard. Rated 5 out of 5 by LoveOrganizationInMA from Different Use for Utility Board I was looking for a necklace organization solution and already had the Elfa system in our master closet, but didn't want a drawer (figured they would slide around too much). The sales associate, Erika, suggested we try the utility board with hooks and voila - perfect!! Even though we had to eliminate a shelf, it was well worth it! Rated 5 out of 5 by Gromitike from Love everything elfa I had already installed my closet by the time these came out. I removed a shelf and made room for these boards above my slide out drawers and jewelry drawers. I absolutely love hanging my necklaces on this board where I can easily see everything and they don't get tangled. I just wish I had a bigger closet because I would seriously do just one wall of jewelry. Rated 5 out of 5 by MichalB from ELFA System Is The Best I have a older house with small closets and I need to use every inch of it. I tried three other closet organizer systems before I saw elfa system at my friends house. 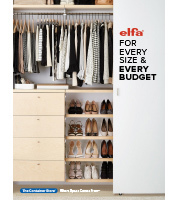 I used elfa in all my closets and in my garage. I like Elfa because ones you put it together it becomes one solid peace. It doesn't swing or move like other systems. Also there is way more available options that other systems offers. What's also important for me is that you could re-arrange it. I already re-arrange on of our closets from a guest closet to to men closet, and finally to kids closet. I recommend elfa to every one. Couple of my friends also got it after they saw my closets. Rated 3 out of 5 by romille from Solid shelf gripes Elfa accessories seem biased towards their wire shelves. I have the solid shelves, and therefore in order to use this board I am limited to the 24" and 25" shelves. Lame. Why isn't there an option for the 30" shelf? I would have loved to put this under all of my shelves, but I wasn't willing to sacrifice a combined 45" of shelf space (3 rows of 3) just to have three of these boards. Instead I only sacrificed 15" by having one 25" column of shelves and limiting myself to one board. Offer a 30" option and I will buy two more and rethink my star rating. Also, we need more hook options. None of the hooks fit the holes built into the handles of my rotary cutters, so I had to just lay them on one of the board trays. And some of the hooks are a royal pain to snap in, while others are easy as can be. Rated 1 out of 5 by JSNJ from Cannot move This is unmovable once initially placed. One mistake in placement will cause a permanent mistake in your whole design. Very disappointed in this product. Rated 5 out of 5 by NolaTex from No limits My husband and I LOVE to cook so we enclosed a 40' X 5' section of our garage and brought it into the house as a pantry. I have these panels running down one side and have used the hooks to hang all of our pots and pans and the utility shelves to display all of the spices, etc. It is GREAT! I can see all of my spices and get to them immediately and can now use all of our pots and pans as they're easy to get to (no digging through a cabinet drawer). I've also been able to get my ironing board out of my coat closet and hang it at the end. As a side note, running down the opposite wall we've used the Metro Commercial shelving to store our soda, canned goods, etc as well as seasonal items. Rated 5 out of 5 by ThisLittlePiggy from Amazing Office Organization When relocating from a 2500 SF single family home to a 750 SF condo, I've found that making use of every square inch of space makes a big difference - and, of course, that's where the container store comes in! I used the 15" platinum Elfa utility board along with a stainless steel magnetic dry erase board, the burst bulletin board by Umbra, and a magnetic bulletboard strip by Umbra inside a hall closet to keep my recipes to try, bills to pay, coupons, and office supplies in order and easy to see and access. Lime green and white polka dot take-out cartons and a large lime green zig zag pot were secured to the organizational center using magnets to provide pops of color and useful storage for writing utensils, rulers and staples. Magnetic spice tins rounded out things nicely allowing for easy storage of paper clips, binder clips and tacks. I'm thrilled to have such a functional and beautiful way to keep myself organized! Rated 5 out of 5 by painterbc from Efla in an Art Studio I love this product and have it in the garage, closets, pantry and even my art studio. It helps keep everything in it's place and gives me easy access as well as utilizing space! Rated 5 out of 5 by GingerG from If you're a creative type - you'll love this! You can see everything in an organized way. If you are like me whose style is to have everything visible but pretty - then this will help you achieve that! VERY STURDY and it helps make the entire ELFA structure more stable. Rated 5 out of 5 by Myorganizedarea from elfa utility board (old fashioned kind) Elfa allows you to utilize your work bench by keeping items organized and neat. I love mine! I wish they would have had the new boards when I bought mine but this one works great, too! Rated 5 out of 5 by krq11zipe from Elfa Utility Boards I had no trouble installing except my measuring for drilling the holes was off by about 1/2 inch. Could not use the anchors or screws they were way to long for applying to a hall door. Once it was up and hangers in place I filled it up with broom sticks and mops, etc. Love it!! Rated 5 out of 5 by hmlp from Great product Bought this with the hooks to hang all my necklaces in my closet so I can see them better. Makes putting together outfits so much easier. Love being able to see my necklaces and bracelets. Rated 5 out of 5 by BarbieMac from Love it! Such versatility and usefulness with my Elfa desk. Rated 5 out of 5 by CindyA from great purchase We had our garage organized by The Container Store. We love it and went back to buy several elfa utility boards. It was a great choice. We have 3 above a work bench. They hold a variety of tools and keep things so handy and out of the way when we are not using them. We also put one above a small area that we had designed for gardening. Have gardening tools etc. on it. The elfa utility boards are an excellent way to keep things out of the way, but so handy to get when you need them. Can't wait until our next project. Will call the container store to help. Rated 5 out of 5 by Softball14 from Scrapbook organization I combined the Utility board with the over the door brackets to create additional scrapbook storage area using otherwise unused space. The Utility products offer a variety of options for all sorts of storage needs. Rated 4 out of 5 by goldent from Great addition to my elfa office component system I use it to put magnets on so I can post reminders. I also a utility tray on the board and it holds my post it notes. Rated 5 out of 5 by SHARRON from UTILITY BOARD I love it!! All of the items that I use on a regular basis as well as items that I sometimes forget about are right in front of me!! Rated 3 out of 5 by Bridget212 from Great idea but not easily movable I love Elfa products and this Utility board is a great idea. There is just one major flaw in the design of this- it is impossible to move it once it's "clicked" into place. After I brought it home to use with my 6' shelving unit and desk, I placed it where I thought I wanted it. After a day I decided I wanted to move it, except I couldn't get it off! I had to disassemble the ENTIRE shelving unit, and literally yank and kick the back of the board off the hanging standards. The rest of the Elfa system is easy to move and customize but don't hang this on until your 100% sure you know where you want it! Rated 5 out of 5 by goldent from Great utility board that you can add to. I decided to try this utility board as an addition to my office elfa component system and found out it was a great investment. I bought elfa utility shelves and hooked them right into the board. Love it. I can also use magnets on it, as well. Has anyone installed utility boards with wall mounted standards? I've been thinking about installing wall mounted standards so they would be more solid than the easy hang standards, but I'm worried. If my wall mounted standards are screwed slightly off, would it make it impossible to install the utility boards which seem to require a more exact distance? Has anyone successfully installed utility boards with wall mounted standards? I tried. I did not succeed. If it weren&rsquo;t for the lip that&rsquo;s at top and bottom it would be possible as I have two standards on each side giving me essentially 4 slots each side to choose from / fit on, but my spacing is just slightly too narrow for this to work as the lip prevents the hooked back from meeting up with the rails. So bummed. Can non-Elfa attachments be used? Are we restricted to only using pricing Elfa accessories with this pegboard, or can standard pegboard accessories be used to store knickknacks, etc. I just installed this, and I'm pretty sure you must use Elfa accessories on this pegboard, because you'll note it has slots, not standard pegboard holes. The good news is the accessories are inexpensive, e.g., $3.00 for 3 hooks. If you buy this, be sure to arch the hooks out before pushing down on them, or you risk snapping off the holding bracket on the back. Do these come in 16&rdquo; widths? No, according to the website, they come in 18&quot;, 24&quot;, 30&quot; and 36&quot; widths. Which end of the utility points upward? When hanging a utility board is there an end pointin up and one pointing down? How can I tell? The Elfa sticker and the illustrated instructions on the utility board will help. I have an Elfa utility board that I need to remove. I can not get it to budge. Can you please tell me how to remove it? I inserted one of the system's small plastic hooks near the edge tab and pulled the board toward me, then pushed the bottom edge of the board up. Worked like a champ. how do I unclip the utility wall once installed?? Please give me step by step directions on how to unclip this wall. it is very difficult to unclip. The container store answers to this question and to a similar plea further down the page require clarification. There is a small tab in the middle of each side of the board which locks the board into place. You need to free those tabs from their slots first. I used a small but strong flat head screwdriver to carefully pop each one free, trying not to bend them. Once these little locking tabs are free, you can move the board up (or the standard down) to free the large hooks. I had to use a mallet. Is this board exactly 24 inches wide? Can you hang objects from both sides? I notice the utility board seems to be set on the inner row and wonder if it could be set on the outer row? I want to attach a couple of the boards to the following frame. It is 22 3/4 inches from edge to edge wide. I want to use the frame to set up a stained glass and jewelry display. Thank you. Our utility boards come in 24'' and 36'' widths. Please contact our customer solutions department to further discuss your needs. Can the board be hung in either direction, or will the holes only work one way? The elfa utility Boards may be hung horizontally only. The hooks, which allow it to attach to Wall Mounts, Standards or Uprights, are affixed along the left and right sides.